"In the time of chimpanzees, I was a monkey"— Beck had me immediately with that first line of his 1993 song “Loser." I was already intrigued by the opening guitar line and beat, but when I heard that line I laughed out loud with joy. It was so funny, clever and different than anything I’d heard before. As the song went on, so many other lines jumped out at me: "With the plastic eyeballs, spray paint the vegetables;" “Get crazy with the cheese whiz;” “And my time is a piece of wax fallin' on a termite, that's chokin' on the splinters." None of this made any sense, but I loved it! When the chorus came in—“I’m a loser baby, so why don’t you kill me"—it sounded like an anthem. Like many Gen X-ers of the '90s, I was really attracted to that slacker vibe (pretty apparent in this 1994 interview with Thurston Moore). Beck also used a sample from a Steve Hanft film of someone saying, “Things are gonna change, I can feel it" in "Loser," and that was so true. Music during that time began changing, getting less polished, and more weird and fuzzy. The video for "Loser" became a staple on MTV which was a really big deal because MTV were the tastemakers of the '90s. The video itself was quirky with tons of non sequiturs: scenes with car chases, cheerleaders, coffins and Beck (swoon) playing an acoustic guitar that was on fire. He was breakdancing and walking on the beach like some cool California surfer dude—I was in love, but it made me kinda nervous to say so. A lot of people thought that “Loser” would be Beck's one and only hit. I was with him, though. I got Beck's album Mellow Gold on cassette and was super into it. Aside from “Loser," the songs “Soul Sucking Jerk” and "Beercan" were on that album. “Beercan" sampled the Care Bears' "I Feel So Alone" which played into my sense of nostalgia, even as a teenager. A few years later Beck released the masterpiece Odelay and at that point no one could deny that this kid had talent. He was way ahead of his time, making music that was so innovative and clever. I loved all of the songs and to this day, that album is still one of my all-time favorite records. I often quote Beck's "Where It's At" when I get on the air saying, “I got two turntables and a microphone." It’s fun. 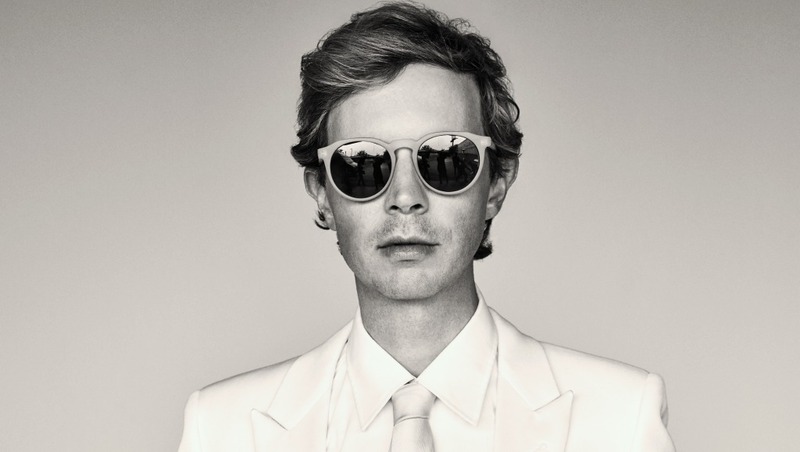 Throughout his career, Beck has exposed me to folk, Tropicália, funk, country and countless other genres and styles of music. Back in the '90s, when I first fell in love with him, I saw him as just a fun, eclectic musician. I never thought that his music would also accompany me through grief and sadness as it did with his albums, Sea Change and Morning Phase. I feel like I’ve been through so much with Beck and we’ve grown up together. He's like an old friend to me. The first music interview I ever did was with Beck. I was so nervous that I thought I was literally going to throw up. I didn’t. Whew. Could have gone either way. It really was a close call. But I made it through. And guess what? Beck was the nicest guy. He was kind, thoughtful and funny. Just as I’d hoped he’d be. Beck would go on to show what a great guy he is, many times over after that. Remember how gracefully he handled the Kanye West fiasco at the Grammys last year? Beck continues to create some of my favorite songs. His latest single, “Wow,” is appropriately titled, because, wow, it really is great. Probably my favorite song of the summer. Without a doubt, Beck Hanson is a truly talented and wonderful individual. He has already provided us with a huge catalog of fantastic music and the guy just keeps going!